Visitors to city parks don't want to see or be bothered by feral pigs, which is why one city council in Alabama has contracted with a trapper to remove the porcine problem. Feral pigs have become a problem in Eastgate Park in Dothan, which is in southeast Alabama. It's in an area known as the Wiregrass, due to the stubby grass found there. The area also is known for its annual prolific peanut output. 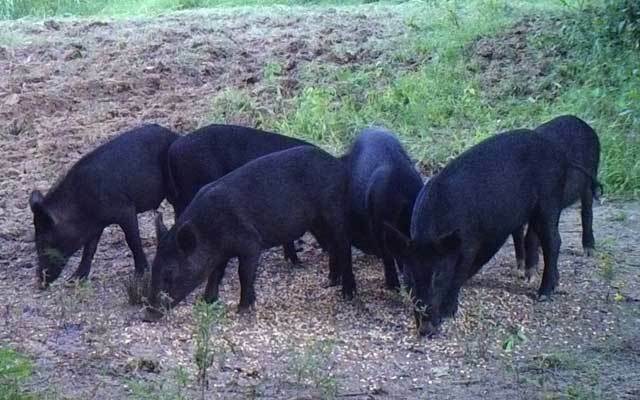 With ample habitat, agriculture and creeks feeding the Choctawahatchee River that drains into the Gulf of Mexico, feral pigs have quite a great life in the region. Now they're making problems in the city park and Dothan officials are doing something about it. The city has contracted with commercial trappers to try to get rid of the persistent porkers. Keith Owens with B&O Pro Feral Hog Control said his team will begin surveying the park and establishing bait sites for traps. The city will pay $750 per "trapping event," but Owens said he's unsure how many events it might take to make a dent in the population. The 200-acre park has areas for sports, picnics, disc golf and walking trails. It is bisected by Cooper Creek, which is wooded and connects with a larger creek. Agriculture fields are located near the park, all of which offer the feral pigs areas for food, shelter and travel routes. Sows can have multiple litters each year and with few predators or impact from humans, the population can grow rapidly. Owens said a sow with piglets, especially an older one with age and size, can be dangerous around park visitors or their dogs.